Do You Have Questions About Ice Dams? Pennsylvania and Maryland are subject to an unpredictable amount of snowfall and freezing temperatures. Pair that with the freeze and thaw that we experience throughout the winter season and you have probably seen a few ice dams on your roof over the years. While they are pretty to look at, they can cause significant damage to a roof if not properly taken care of. Read the below guide to understand what ice dams are, how they form, and what you can do to minimize or eliminate future ice dams. An ice dam is a ridge of ice found at the edge of a roof. Homeowners may notice icicles hanging from the gutters or roof which is a sign of an ice dam. The ice barrier takes longer to melt than the snow or thin layer of ice on a roof and prevents the melt from running off the roof. As the water backs up in the gutters, it can spill over and leak behind the siding or under the roof shingles into the home causing water and mold damage inside. Are Ice Dams Covered By Insurance? In most cases, ice dam removal and damage is not covered by insurance policies. A homeowners insurance policy provides coverage for roof damage for falling objects (tree), wind, and hail. Ice dams are not considered a covered peril on homeowners insurance policies. It still never hurts to contact the insurance company and ask. To prevent ice dams, a home’s roof must always be the right temperature during the winter months. To determine if your roof is the right temperature, look at it after a snowfall. If the roof gets too warm too quickly, there will be bare spots with no snow; but if it is the right temperature, it will be covered by a blanket of snow. Close any leaks- Approximately one-third of a home’s heat is lost through cracks and holes in ceilings, drywall, access areas, and chimneys. Thoroughly inspect these areas to assure no air is escaping. Check attic insulation- Every home should have 12-14 inches of fiberglass or cellulose insulation in the attic. Install roof and soffit vents-The purpose of attic ventilation is to draw in cold air and flush out warm air, cooling the attic and the roof in the process. Ventilation areas need about one square foot of vent for every 300 square feet of attic floor. Remove ice and snow. Use a snow rake to remove loose snow from the roof by standing on the ground and pulling the rake towards you. Chip away ice. Using an ice pick, chip away at the ice build-up in the gutter until there is a big enough gap for the melt to travel through. Use a chemical de-icer. Found at local home improvement stores, this can be sprinkled on the ice dams to melt the ice slowly. Ice dams can cause significant damage to a home’s roof if ignored for too long. To assure your roof is in excellent condition for the winter, contact the roofing consultants at Bealing Roofing & Exteriors, Inc. today. 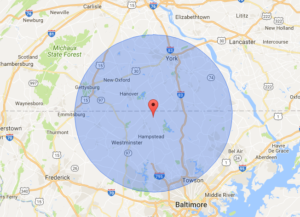 We service South Central PA and Northern MD.